Limerick : a city that thrived during the boom years and, even now, still has a feeling of vibrancy in the streets. They've fought hard to clean up their act and get rid of that nickname. 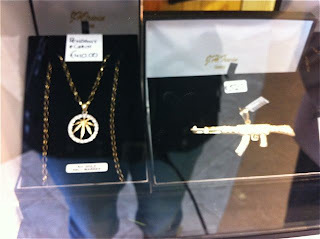 While window shopping last Saturday, a jeweller's shop caught my eye. Oh sez Granny, they're one of the oldest jewellers in Limerick, they're very good. 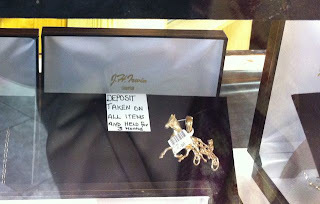 So we crossed the road and had a look in the window. Yeah. That's a cannabis leaf pendant on the left and a blinged-up armalite on the right. 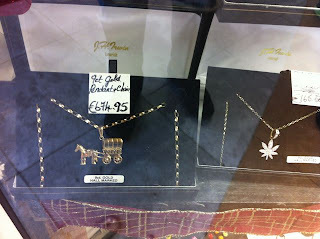 I guess this jewellers caters to... hmm... an interesting cross-section of the underbelly of society, shall we say. Sorry, Limerick, you'll always be Stab City to me. Granny's from Dublin. When she says something, she SEZ it. Love it! As I work in Limerick I am all too familiar with that culture.